This is one of the strange deep sea creatures found by a team of scientists in a recent underwater expedition to the deep sea mountain range of the Mid Atlantic Ridge. 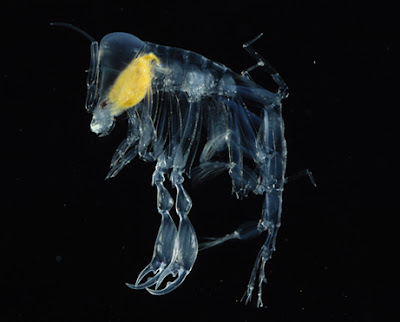 It is called a Phronima---transparent with its insides visible---in order to be practically invisible to predators. Still, it looks pretty mean by itself. It's head is reminiscent of a baboon's.